This first Sector Signal from Mowat NFP looks at the current climate of fiscal restraint, and the implications for that part of the NFP sector that provides government services. Various levels of government and other funders have positioned “integration” as a key strategy to achieve more efficient and effective service delivery. This report highlights different approaches to integration that have been developed, challenges and benefits of each, and makes recommendations on the way forward. While the report is focused on the experience in Ontario, the context and challenges are shared across the country. The not-for-profit (NFP) sector is an essential and vital partner in the delivery of public services in Ontario. The sector provides flexible, responsive and diverse programs and services to meet the needs of local communities. NFPs know their communities and understand the challenges people face when accessing systems of services. But recent fiscal restraints are challenging the sector to do more with less and NFPs are feeling the pinch. The Ontario government has indicated that current provincial budget deficits require a stricter approach to government spending. In particular, spending on community-based social services will experience a significant slowdown in growth and NFPs will be asked to create further efficiencies. At the same time, NFPs will be asked to make services more accessible in an environment of growing need. Government funders have positioned integration and better coordination of NFPs as the path forward for a more efficient system of public service delivery. 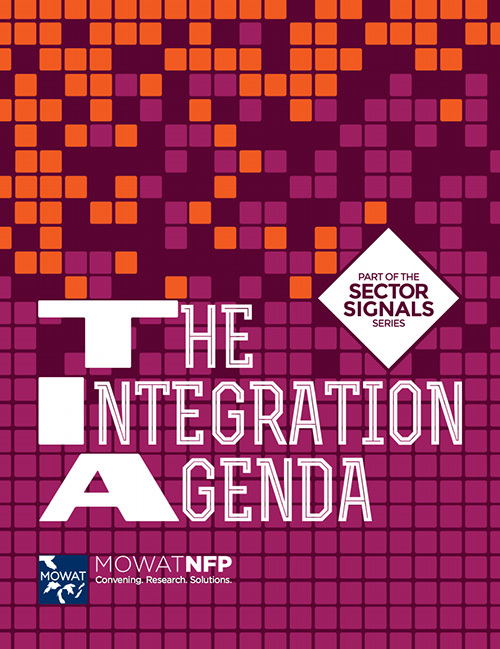 This first Mowat NFP Sector Signal looks at some of the innovations that have been developed by NFPs, partnering with government and other funders, in response to calls for integration. This report explores some of the challenges and the potential benefits for program outcomes and communities. As a Sector Signal, this report is intended to surface the emerging trend toward integration and identify early responses. Sector leaders and funders were interviewed for their perspective and experiences, and four examples of integration were identified, offering lessons for NFPs and funders. The objective of this report is to highlight options and opportunities going forward, and to make recommendations for further study in this area.